Skills and abilities: Skilled fencer and sword fighter. 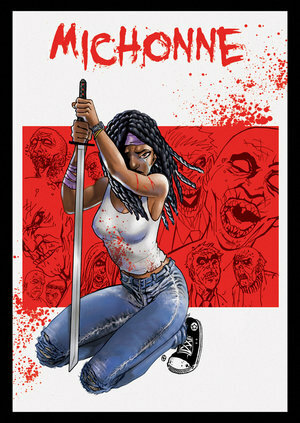 As a child the woman who would come to be known as Michonne took an interest in the art of fencing. In college she continued to study this martial arts form at which she excelled. She graduated from Law school and settled into the life of a lawyer in Atlanta, Georgia where she fell in love and had two children and went on to be divorced. When the dead started returning to life a chance visit with a neighbour lead her to take up the sword. Her boyfriend and his best friend where later infected and reanimated thus she cut off their jaws and arms to prevent them from attacking her. She carried them around on chains explaining their presence decreased the chance of other zombies attacking. She later joins the other survivors at “the prison” and started a relationship with “Tyreese” a former NFL star. She was a part of a small group that investigated a plane crash and discovered the town of Woodbury where the mayor eventually betrays and rapes/assaults her. When she escapes she tortures the governor instead of ending his life. He later retaliated and attacks the prison. Her lover Tyreese is killed in the conflict and she flees. Along with other survivors she settles in the town of Alexandria which is free of the undead.